QUẢNG NINH — Waste water treatment and tourism management at world heritage site Hạ Long Bay were among issues highlighted at the fifth leadership committee meeting of the Hạ Long-Cát Bà Alliance in Hạ Long City, in the coastal province of Quảng Ninh, yesterday. The meeting, organised by the International Union for Conservation of Nature and Natural Resources (IUCN) and funded by the US Agency for International Development (USAID), included debates on how to attract private investment in a waste water collection and treatment system tailored for the upwards of 500 cruise vessels that operate in Hạ Long Bay and Cát Bà Archipelago. Attending the meeting were representatives from UNESCO, the Ministry of Foreign Affairs, Ministry of Culture, Sports and Tourism, authority officials from Quảng Ninh Province and Hải Phòng City, as well as from USAID. A report on the alliance’s initiatives to develop a waste water treatment system was presented at the meeting, based on the results of interviews and research with large cruise companies in Hạ Long on the need for a waste water system in Tuần Châu Port and the feasibility of applying the Green Lotus label for cruise boats. Accordingly, the research from IUCN showed that about 502 cubic metres of waste water was daily discharged from cruise boats in Hạ Long Bay. This total amount of waste water was estimated to originate from different sources, including about 250 litres from each tourist staying overnight on a boat. The meeting also heard solutions to solve the waste water management issues at the bay including boosting the participation of enterprises, the diversification of financial support and promotion of policy making dialogue. A series of activities to promote such initiatives had been organised by the alliance during the period from last May to February this year, attracting attention from tourism businesses at the bay, particularly the cruise boats. Information on the potential and benefits of a waste water treatment system had been shared among cruise boats. Meanwhile, cruise boats also contributed useful opinions on the feasibility in the implementation of the Green Lotus label and the reality of waste water treatment for the vessels. 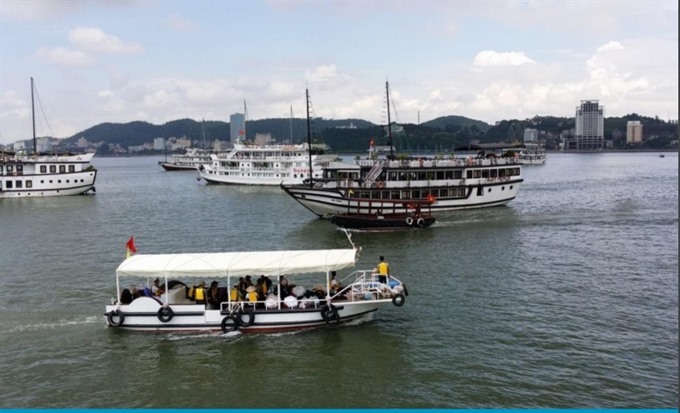 Presenting an analysis on the initiative of a waste water system for cruise boats in Hạ Long Bay, Nguyễn Thị Bích Hiền, a IUCN representative, said initial total cost estimated for the whole system stood at around US$3.1 million, including $1.2 million for 12 boats to collect waste water from cruise boats and $1.3 million for the installation of waste water treatment stations in the port and facilities for cruise boats. Hiền said along with promoting the participation of tourism service enterprises including cruise boats in the initiative, increasing their awareness on communication was also very important. At the meeting, the Cát Bà Heritage Management Commission provided an update on the renomination of the Hạ Long Bay UNESCO World Heritage Site (WHS) to include the Cát Bà Archipelago and plans for co-ordinated management of the expanded WHS between Hải Phòng City and Quảng Ninh Province. At the request of the Quảng Ninh Province’s People’s Committee for assistance on sustainable tourism management and environmental protection in Hạ Long Bay, the IUCN said it would co-operate with UNESCO to organise an advisory mission of specialists from the two international organisations, who would help address the site’s development challenges.